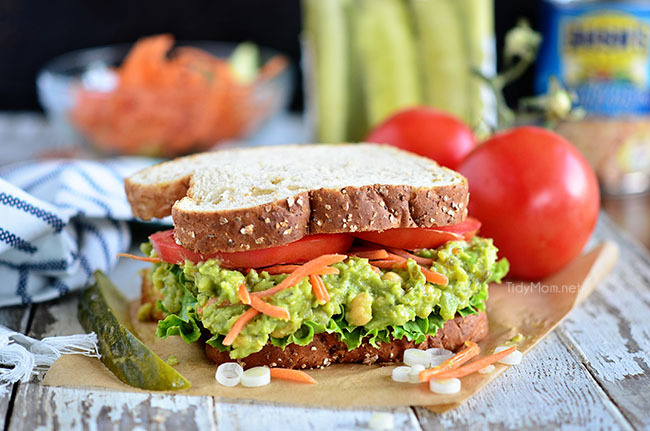 This Sweet Heat Chickpea Avocado Salad Sandwich has a creamy yet sturdy texture with a hint of heat from the mustard and sweet from the pickle relish. There’s a bit of crunch here and there from the celery and the dill adds a touch of freshness. Basically sandwich magic between two pieces of multigrain bread! July is gaining on us you guys. Where has this year gone already? With Summer in full swing, I’m doing my best to be a little bit more conscious about what I eat. I’m trying to focus on fresh fruits and veggies and wholesome food. While I am doing this to create a bit of a healthier lifestyle, I find myself craving fresher ingredients this time of year. Do you ever have those recipes where you absolutely cannot wait to make and bite into? That’s how I felt when I first saw Maria’s Avocado Salad . I loved the simplicity of it and of course the ingredients. I’m always up for any way I can eat avocados, and the idea of using chickpeas for something other than hummus got my attention! 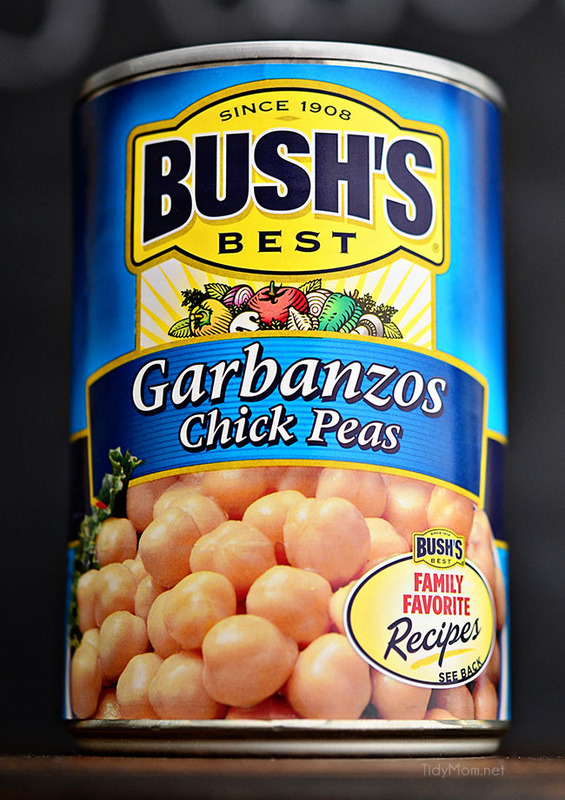 When my friends at Bush’s Beans asked me to create a recipe using their Garbanzo Beans (aka Chickpeas), I knew I wanted to make some sort of salad. Then I thought about how much I love egg salad, so I decided to give this chickpea and avocado salad a similar spin, by adding sweet pickle relish, celery, green onions, dill weed and sweet hot mustard. A sandwich full of flavor that I could feel good about! Chickpeas have a translucent skin on them. When you smash up the chickpeas, the skins come loose. You can either leave them alone and just mix the smashed chickpeas with the peels to the avocado or you can spend a few minutes removing them . 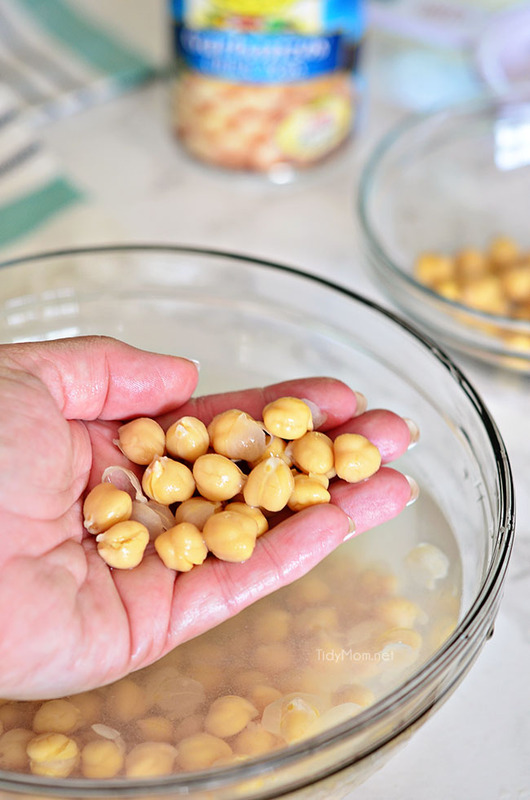 To remove the skins from chickpeas (garbanzo beans); drain the beans and place in a medium bowl. Cover beans with water. Using your hands, agitate the beans in the water then lift out a handful of beans. You should see the skins separated from the chickpeas. Discard the peels and place the chickpeas into a bowl. Repeat the process until you have removed the skins from all the beans. Don’t worry if you don’t get them all, it’s perfectly fine to eat the peels. Removing the skins is a bit tedious, but the chickpeas will be creamier when smashed, without them. Sometimes the taste of raw chickpeas can be, well a bit raw. But by smashing them with avocado you’ll be shocked at how delicious they taste. 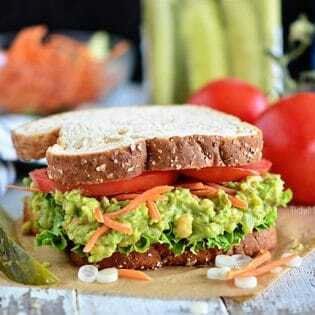 I love that you can whip this smashed chickpea avocado salad sandwich up in about 10 minutes and have enough for 3-4 sandwiches. Everything I need to feel satisfied, like I just ate something totally sinful! Smashed Chickpea & Avocado Salad would also be wonderful on crackers, pita chips or as a dip for veggies. CHECK OUT HOW EASY THIS SWEET HEAT CHICKPEA AVOCADO SALAD RECIPE IS TO MAKE! WATCH THE VIDEO! It actually tastes even better the second day, after the flavors have a chance to fully incorporate. Just refrigerate leftovers in a sealed container. It looks the same the next day (or two), the avocado did not turn brown. Rinse and drain chickpeas. To remove skins, place chickpeas in a medium bowl with water. Agitating the beans in your hands to release the skins. Place skinned chickpeas in another medium bowl, discard water and skins. 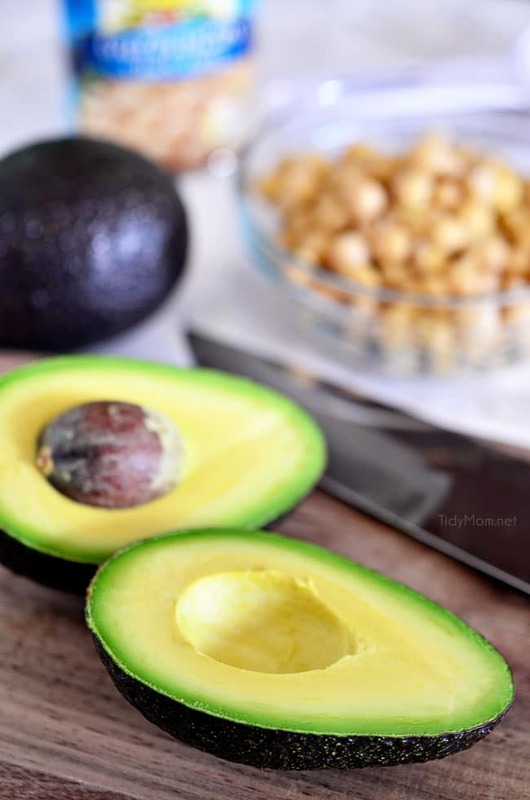 Add avocado to bowl with chickpeas. Using a potato masher or fork smash chickpeas and avocado together. Add in relish, mustard, green onion, lemon juice, dill weed and celery. Season with salt and pepper, to taste. Serve on bread. I used multi-grain bread and topped it with lettuce, shredded carrots and sliced tomatoes. 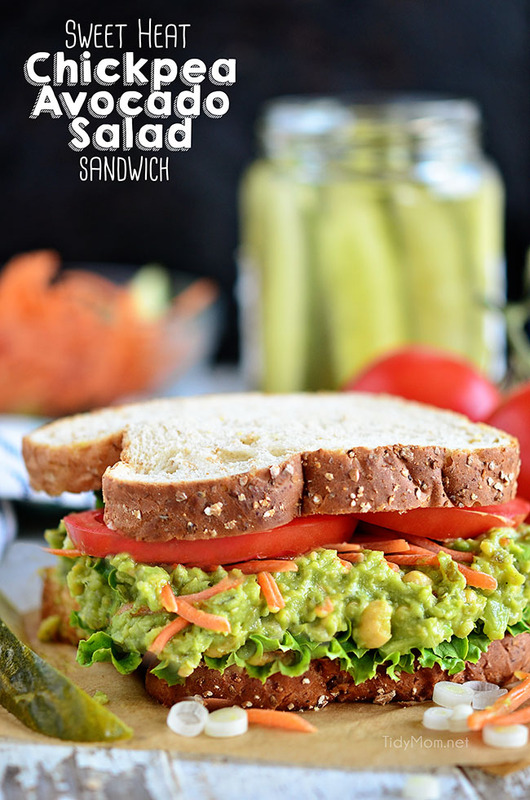 Like this Sweet Heat Chickpea Avocado Salad Sandwich recipe? PIN IT for later!! Disclaimer: I grew up in a house that used Bush’s Beans. I am now fortunate to have an ongoing relationship with them as a brand ambassador for the past 5+ years. This post is sponsored by Bush’s Beans, but as always, all opinions are my own. Thanks for supporting the brands that make TidyMom possible. 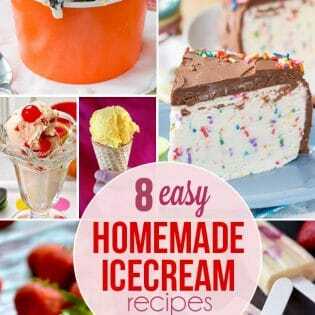 For more great recipes like this one, please visit their website. How in the world do you make a bean sandwich look so dang appetizing?? That is gorgeous!! And I want to dive right in – love this use of chickpeas! Yum! I often make a plain chickpea and avocado salad sandwich, but I love the additional flavors you’ve added! 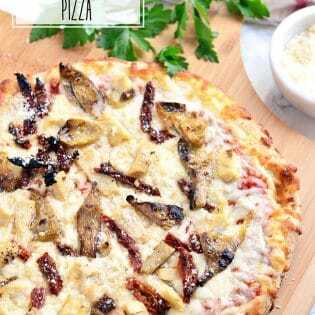 My husband and I were just talking about incorporating more vegetarian recipes into our diet — this looks perfect to add to my (very short!) list! I love the combination of chickpeas and avocado! This would be a huge hit at our house! I can’t get over how delicious this sandwich looks!! I know I’d love it for a weekday lunch! I love chickpeas but have never thought to mix them with avocado let alone make a sandwich out of it. Yum! Looks like the perfect lunch to me! I love chickpeas and avocados! 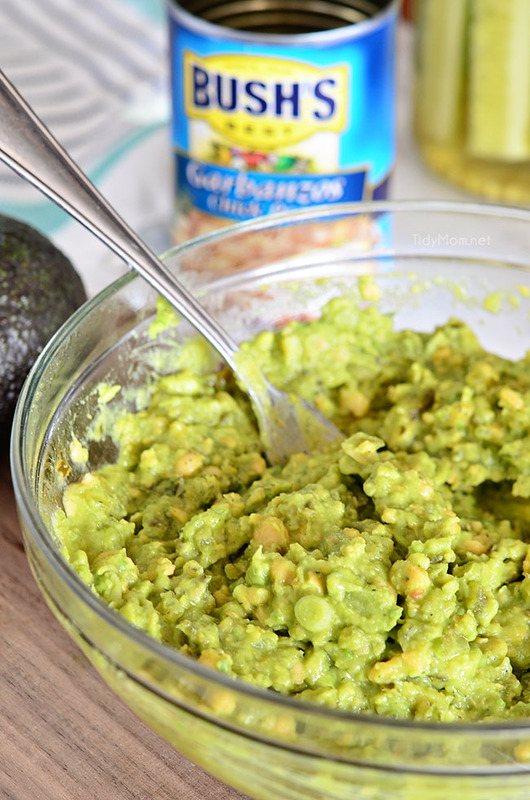 What a great idea…to combine avocado and chickpeas! I love this!!!! Chickpeas make me feel like a fussy toddler. I simply hate them. But, Cheryl, this sandwich of yours looks so yummy and I trust you when you say it’s creamy. So I’m on it. I love this sandwich, it’s so inviting. The perfect lunch or light dinner recipe. I have to try this one. My kind of sandwich- can’t wait to make this one!